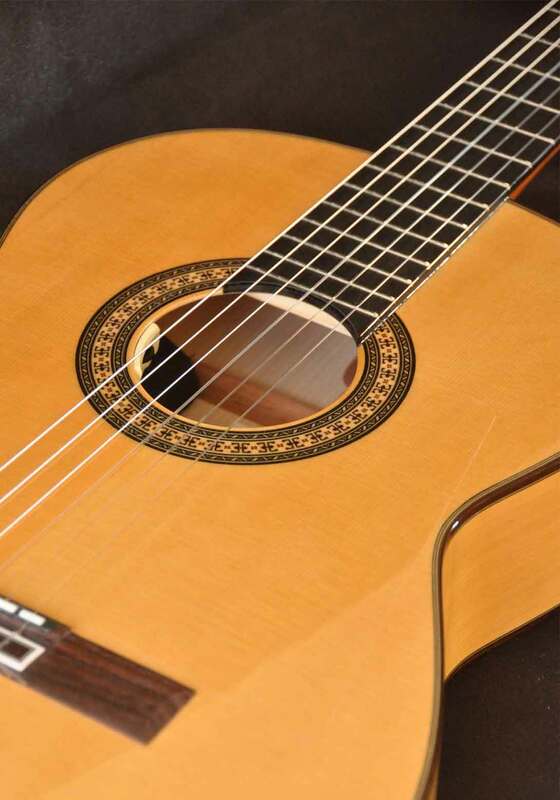 In the last few years, The Camps Primera Flamenco guitar has become one of the most popular and demanded flamenco guitars in the range of professional flamenco guitars for its great quality price ratio. This guitar is beautifully crafted with quality woods and has very authentic flamenco sound with a great action and feel. The guitar is very light and the neck is incredibly comfortable, two of the main features that have made Camps guitars so popular. Made with a Solid German spruce top, solid Spanish cypress back and sides and a beautiful ebony fretboard, this well balanced guitar deserves its great level of popularity among guitarists that want a quality flamenco guitar without spending an arm and a leg on a professional hand made guitar. The popularity of the Camps Primera has led into the launch of other models based in this guitar like the Camps Primera Negra, a rosewood body version of the Primera or the Camps Primera A, an upgraded version of the Primera with a more elaborated and higher graded wood top. The latest addition to the Primera family is this electrified version that we are presenting here: The Camps Primera E. Its not new that more and more guitarists are demanding a good electrification system for their classical and flamenco guitars. Previously, only entry level or mid level models offered electrified versions on nylon guitars but the demand of professional classical and flamenco guitars with high-end electrification systems have increased thru the years. The Camps Primera E comes to fill that demand with a fantastic and proven flamenco guitar with one of the newest and best sounding electrification systems for acoustic guitars in the market: The LR BAGGS Anthem SL Classica, with pickup and microphone. The LR BAGGS Anthem SL Classica is one of the less invasive electrification systems for classical and flamenco guitars out there. 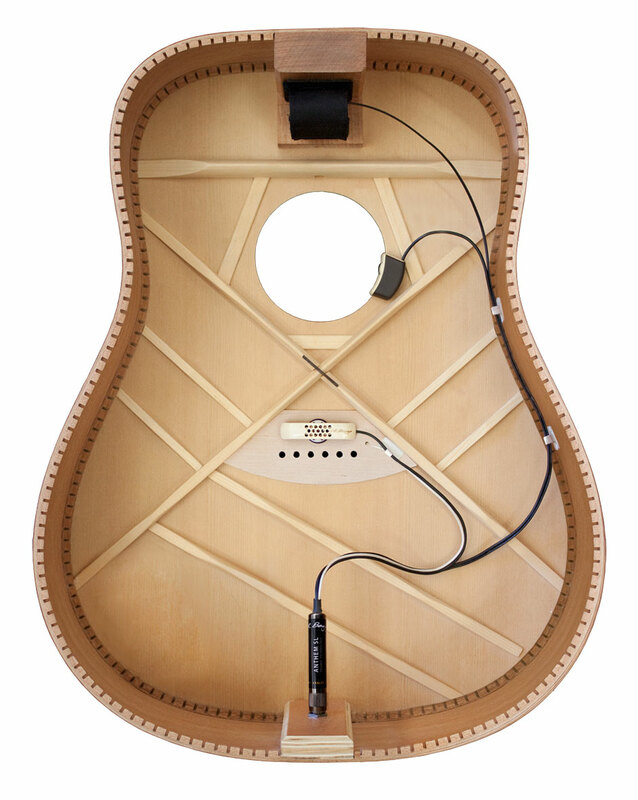 The preamp is located at the end of the jack input and the volume control is located discreetly on the sound hole of the guitar. 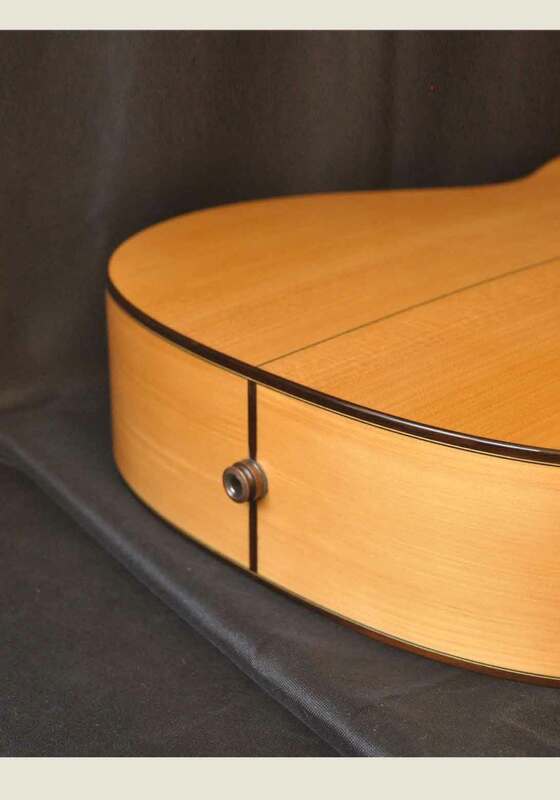 No extra holes on the sides of the guitar are required so the resonance of the guitar is preserved and there is hardly any extra weight added. Even with such a simple and minimalist installation, we still enjoying two sound sources, one coming from the piezoelectric pickup installed under the saddle and another one coming from a very sensitive and feedback free microphone installed under the soundboard. The result is a punchy yet very natural sound thanks to the combination of the two signals. Many people do not even notice that the guitar is amplified. There is nothing visible from outside. Aesthetically and practically that may be a must for some guitarists. The only drawback of such systems is access to the battery. This is installed on the inside of the guitar, and the only way to access it is through the sound hole, once we have the strings loosened or removed. Fortunately, this does not happen very often, and if we care to disconnect the guitar cable from the guitar every time we stop playing, the battery will last long enough. Another great feature that distinguish Camps electroacoustic flamenco guitars from other manufacturers is the divided saddle. That saddle is divided into 6 individual pieces in order to give the maximum string pressure to the piezoelectric pickup from each string. That divided saddle gives a very well balanced sound to the guitar when amplified, solving a very common problem in many electroacoustic guitars. This is the result of many years of research and attention to detail that Hermanos Camps have put into their guitars. On top of that, all the signatures series guitars like this one are tested and certified by famous guitarist Manuel Granados. Posted in Acoustic Guitars, Classical guitars, electro classical guitars, electroacoustic guitars, flamenco electric guitars, Flamenco guitars, flamenco instruments, flamenco music, guitar, Guitar manufacturers, guitar music, guitar reviews, Spanish guitars and tagged Acoustic guitar, Anthem SL Classica, best flamenco guitar, buy flamenco guitar, buy flamenco guitar direct from spain, buy spanish guitar, camps flamenco guitar, Camps guitars, Camps Primera E, camps primera opinion, camps primera review, electroacoustic flamenco guitars, flamenco guitar, flamenco guitar price, Guitar, hermanos camps guitars, LR BAGGS Anthem, Spanish guitar making, Spanish luthier. Bookmark the permalink.